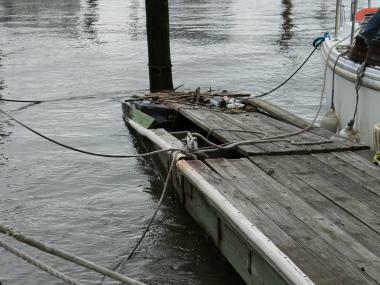 Tom Fox has complained for years to the Parks Department about the broken dock by his boat in Riverside Park's 79th Street Boat Basin. UPPER WEST SIDE — The 79th Street Boat Basin is set to receive long overdue repairs to some of its aging docks this week, the Parks Department told boaters. But the promised improvements haven't quelled the controversy over the price of docking a boat in the marina full-time. Tom Fox, whose boat the "Druid" has been at the Basin since 1987, said that for years half of Dock D next to his boat has been unusable. It costs $5,880 per year to moor an average-sized 30-foot boat. The Parks Department has proposed an increase of 11 percent — which would mean $6,527.80 for the same vessel. Fox said the dock is partially submerged in water and rotting, and seagulls have set up camp on the heap. He has complained, he said, but to no effect. Instead, he takes care to step only on the stable part of the dock. More than anything, he worries about guests who might misstep and stumble onto the sinking dock and fall into the water. This week, the Parks Department assured him that his dock would get a facelift. "A full-time carpenter is assigned to the 79th Street Boat Basin and he focuses on dock reconstructions and other facility upgrades including working closely with contractors," said Nate Grove, Parks’ Senior Manager for Marinas. "New docks were purchased and delivered last year and another shipment is arriving this week. We continue to swap out worn docks with new." In addition to safety concerns, Fox said he and other longtime boaters have been agitated about the steadily increasing bi-annual fees the city charges them to station their boats at the Basin. For the high season, from May 1 to October 31, docking costs a minimum of $2,700 at a rate of $108 per linear foot. For the rest of the year, docking costs a minimum of $2,200 at a rate of $88 per linear foot. Last December, the Parks Department proposed raising the fee by 11 percent, prompting an outcry from residents — about 40 boats are utilized as full-time residences — and long-term renters. The boating community was especially exasperated that the department did not propose raising the fees for short-term docking. Fox said he believes the fees and the repairs are part of the city’s long-term strategy to convert the 79th Street Boat Basin from a colony of full-time residents and New Yorkers to a hub of short-term renters who dock for a few nights after sailing from places such as Bermuda. That business model would bring in more revenue, he said. In 1994 the city stopped issuing full-time permits to dock at the legendary, 75-year-old marina, which once hosted the likes of Frank Sinatra and Malcolm Forbes, along with a cast of colorful characters who lived on their boats year-round. The city eventually lifted the ban in 2007, allowing for a small number of new full-time boats a year. The Parks Department maintains a waiting list to obtain a mooring or docking spot at the Boat Basin. In 2009, the Parks Department, which took back control of the Basin in 1989 from private management, ruled that all boats must be seaworthy in an effort to root out long-time residents and older boats, critics said. As part of the expansion and refurbishment of the Boat Basin — whether to increase short-term rentals or to move applicants off the waiting list — the Parks Department has invested $2 million towards the complete reconstruction of the northernmost A dock, which dates back to 1937. "[The dock] has seen deterioration of its wooden support pilings due to marine borers prevalent in Hudson River's increasingly cleaner waters," said Grove. "The capital project is in the design phase and we will show plans to the Public Design Commission this summer." On Monday, construction on the D dock did not appear to have begun. Throughout the Basin, docks were in need of refurbishment. Planks of wood were missing or were becoming unhinged, creating an uneven walking surface with rusty nails jutting out of docks in places. "Customers returning to the site from years ago often remark that the improvements are noticeable," Grove said. Fox said he was content with the department’s promise to fix the dock this week, even if it was years late. "Right now everybody is on very good terms," he said.